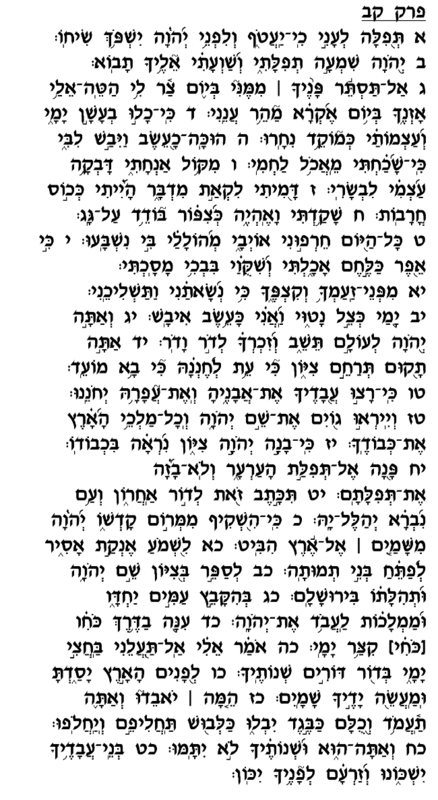 The first twelve verses of this chapter present an analogy by which the exiled Jewish nation is likened to a lonely, destitute pauper. The Psalmist – representing all Am Yisrael – describes the physical effects of his suffering on his body (verses 4-5), and speaks of himself as having forgotten the experience of eating. He then speaks of his feeling of loneliness and abandonment, as he is ridiculed and despised by the other nations. During the bitter exile dust became the Jews' bread and tears their drink (verse 10), as bereavement and anguish appear to have been a more frequent experience than a satisfying meal. In the middle section of this Psalm (verses 13-23), the author foresees the time when the nation's prayers will be finally accepted and <?xml:namespace prefix = st1 ns = "urn:schemas-microsoft-com:office:smarttags" />Zion will be rebuilt. Referring to a theme that runs throughout many chapters of Tehillim, the Psalmist speaks of the gentile nations' recognition of the Almighty as God over the world, and the endless praise that will flow forth from the mouths of people across the earth upon witnessing Israel's redemption. In this chapter's final verses the author resumes his mournful description of his plight and his appeal to God for assistance, focusing mainly on God's eternal power as opposed to the frailty of Israel's enemies. He confidently places his trust in God knowing that He is capable of defeating even the most formidable human force. The metaphor comparing the Jews in exile to an "Ani," a poor man, is a most meaningful expression of our nation's plight and our aspirations for redemption. Like a pauper, we are physically tormented, emotionally dejected, and socially isolated. In the time of Mashiah, as this chapter describes, all these three phenomena will be reversed: we will enjoy wealth and prosperity, we will rejoice and exult in the presence of God in the Bet Ha'mikdash, and we will resume our place as the most admired and influential nation. During the exile we come knocking on God's door as a penniless, mendicant beggar, confident that the day will come when we will once again achieve great prosperity and prominence.